The short TC coaches were based on the UK made R24 & R25 TC cars, but were shorter by one window. The R24/25 cars were based on Pullman Standard designs from North America and had little resemblance to most modern Australian passenger carriages, which were usually smooth sided. Vista Dome carriages were not used by any Australian railway. Moldex shared the tooling for these coaches with New Zealand. During the Tri-ang and Tri-ang/Hornby period between 1958 and 1967 they were produced in three body types and eight known livery variations. All were used in various sets during this period, but only some were available separately. Buffet Cars were fitted with UK made Pullman car interiors. Early Southern Aurora coaches were fitted with seat units from the Series 2 TC coaches. All models were fitted with Australian diecast metal bogies with sleeved wheels and open axleboxes. The MkII coupler was used in 1958 and 1959. 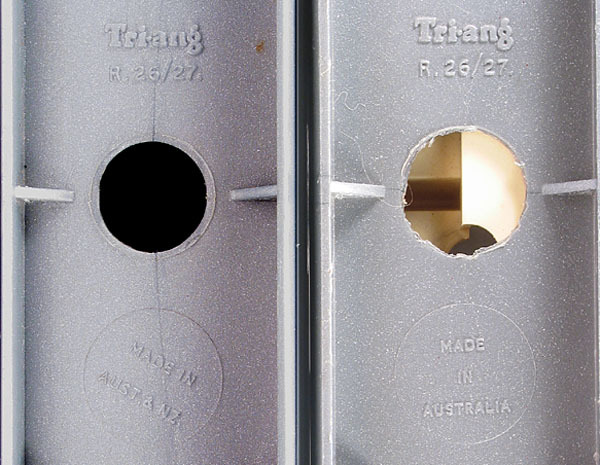 The tool was then modified and used the Australian versions of the MkIII coupler from 1960 to 1967. Early coaches had ‘Made in Australia’, but this was changed to ‘Made in Aust & NZ’ at about the time the ‘TransAustralia’ lettering was introduced in 1962. The two versions are shown in the Photo below. The models produced by Moldex are summarized in the table below. The coach numbers quoted are the ones usually used, but it is not unusual to find the Vista Dome number on a coach, and vice-versa.